I woke up early this morning as I usually do, but I didn’t want to read my book on the “Troubles” in Northern Island called “Say Nothing, A True Story of Murder And Mystery In Northern Ireland“, a powerful non-fiction history of that painful conflict. The book was too sad for me for Easter Sunday, it is always painful to be reminded what men can do to one another. This day marks rebirth for me, people rising. Instead, I went to Netflix for something to watch in the dark. I found a talk by sociologist Brene Brown on vulnerability and courage. Maria woke right up when she heard Brown talking, and we both watched this compelling talk together, since issues of vulnerability, shame and fear have often come up in our lives. On Easter, we both celebrate our rebirth, our courage for life, as Brown puts it. For her, courage means showing up for life, however fearful or fragile we we sometimes are. It means accepting the struggles of meaning, and knowing the truth about ourselves. Maria and I were so stirred and moved by Brene’s talk that we made a podcast about vulnerability and courage and posted it this morning. It’s getting a lot of play. We cultivate love, Brown has written, when we allow our most vulnerable and powerful selves to be deeply seen and known, and when we honor the spiritual connection that grows from that offering with trust, respect, kindness and affection. She wrote something I discovered when I started my blog in 2007. Owning our authentic stories can be difficult but not nearly as difficult as spending our lives running away from the truth about myself. I promised to tell the truth on my blog, the good and the bad, and I believe I have kept that promise. In the process, I was changed, I found my way to my God. Brown wrote something that Thomas Merton also wrote that touched me deeply. You don’t have to be good to do good, and to be loved. None of us are perfect, being flawed is something all humans share, like dying. I was imperfect, wired for conflict, anger and resentment, but I was still worthy of love and belonging, and I was still, it turned out, capable of love and belonging. I once thought this talk kind of wishy-washy, but when you are hanging onto life by your fingernails, light gets through the cracks and the walls. And I found love not because I was perfect, but because I was not. Maria was the catalyst for showing my vulnerability – something few men are taught in life – because she was the first person I have ever trusted completely to allow me to reveal myself. Love is always a risk, as is anything of value in life, love may be the greatest risk, which is why so many people can’t find it or won’t risk it. You really do have to put yourself out there. What a mess I was, but along with Maria, I think my blog saved me. This is where I put myself out there, this is where I showed up every day no matter how frightened or bewildered or lost I was. On the blog, I showed my vulnerability every day, and the world not only didn’t come to an end, but all kinds of people supported me and understood me and read my work, and many are reading me still. My blog gets four million hits a year. This is how I came to understand that no one has a patent on pain and fear and loss. We all have our battles to find, I believe that everyone has it worse than me. That is a way to discover empathy, the most noble of all human feelings or emotions. I think vulnerability is the cornerstone of good writing. I’ve told my students this for years, but most of them can’t do it or won’t do it. I understand, it is a personal choice. It is not natural. Humans, of all species, know to be careful. Just look at our bloody history with one another. The blog taught me to be authentic, to face the truth about myself and share the truth. To shed my secrets one by one until there are no more, and I have nothing to hide. Authenticity is sometimes defined as the choices we make every day. To overcome our fear and limitations. To take the risk of living fully. To show up and do real good in the real world. To be real. And one of the most important for me, a writer, to let my true self be seen and shared. John Updike taught the only writing workshop I ever attended, and he was an apt teacher, not least of all because I was in awe of him and his writing. He said vulnerability is at the heart of every great writer, from Steinbeck to Gabriel Garcia Marquez. Vulnerability is where creativity and change begin and evolve. Vulnerability connects me to other people who are vulnerable, we are a community. We find one another and understand one another. We learn from each other. As much of our country sheds empathy for cruelty and neglect, the vulnerable understand empathy is a very particular way, because their very existence depends on it. Vulnerability requires boundaries, thought and perspective. I don’t mourn on Facebook or share my daily fears and struggles, or discuss them with anyone. I dislike the social media password, “so sorry for your loss,” it is used so often and for so many trivial things that it has lost all meaning and feeling. It is no excuse for words. Enabling is different from supporting. I show myself to people I know and trust, and to a certain degree. Vulnerability has taught me that there is nothing worth doing that is not difficult to do, that does not bring pain and failure and disappointment. No one can escape pain and failure and disappointment in life, no matter how rich or successful they become, or how content they seem. It is the pain and the struggle that make all of us vulnerable, and bind so many of us together. Daily, the Internet and it’s Frankenstein child, social media, challenge us to be strong, to shield ourselves from the hate and judgement that has turned out public places into digital leech fields, the cesspools of culture and communications, places of hurt and rage. Vulnerability makes me strong, I choose the people I wish to talk to. To be vulnerable in a healthy way is to have boundaries, be thoughtful, stay close to people and friendships that nourish, not drain trust and openness. The vulnerable are vulnerable, it is important to learn how to speak up for ourselves and insist that the people around us tell the truth or move away. I learned that vulnerability is not fear. It is often about fear, and that is a different thing. Vulnerability is truth and courage. I’ve learned that only the strung can be vulnerable because people in our world are taught to never show their vulnerability: just look at politics and cable news. In our culture, a politician who shows any kind of vulnerability would be eaten alive by journalists, commentators and opponents. I had a panic attack the other day, it surprised me it is a rare thing for me now. I used to hide my fear, I was ashamed of it, as any bed wetter can testify. When Maria came into my office, I turned to her and said “I just had a panic attack.” She sat down and talked me through it, and I went back to work. I felt strong and powerful. And free and loved. It didn’t matter that I sometimes was panicked by life. Thomas Merton wrote that our technological society values data over wisdom, truth is no longer valued for its own sake, something we see every day in politics. Without wisdom, he wrote, truth can never be found, problems never resolved. Everyone can have data, but wisdom falls only to the few. The first step towards finding a God, said Merton, is to discover the truth about ourselves. The first step to truth is seeing the broken parts of ourselves. Today, this day honoring resurrection and rebirth, I celebrate the power of vulnerability to transform my life, to shed my worst fears and secrets and to find the courage to lie. To show up every day, and take the risk. That is true courage. Ruth got her baby tonight. 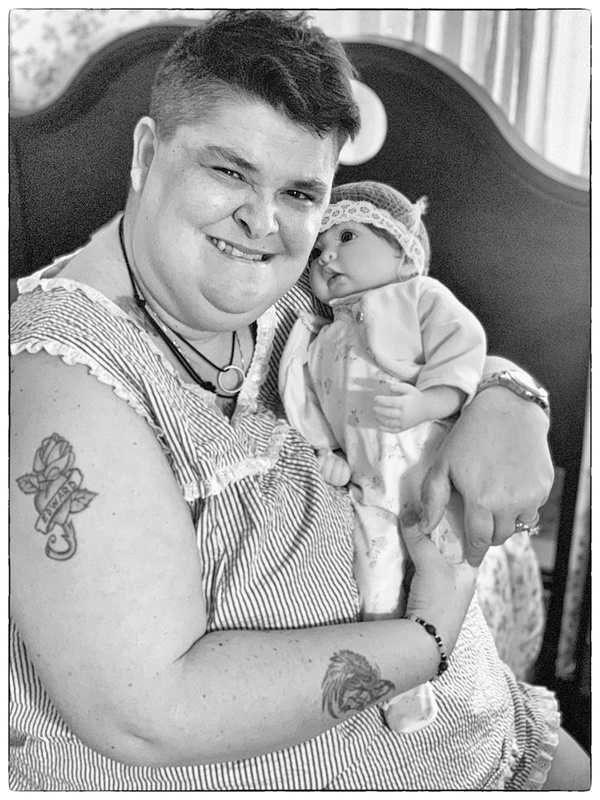 For months, she has been pleading for a baby doll, the aides thought she didn’t really want one or need one, she probably saw that some of the other residents had one. I agreed. Ruth had never asked for a realistic baby doll before. Lately, as I have gotten to talk to her and Wayne about their Commitment Ceremony, which I am organizing, the request took on a different cast. She really wanted this doll, and Wayne seemed to want one also. Then I realized it was somewhat connected to their relationship. Neither of them had had the opportunity to have children, both of their lives were interrupted by misfortune and health troubles. Perhaps they wanted to have more of a family than either of them had ever had. There are now four baby dolls at the Mansion, they provide focus and the chance to nurture. I have a hunch we’ll see this baby doll at the Commitment Cemetery on May 14. The Commitment Ceremony for Ruth and Wayne will be held at the Mansion on May 14. I have been asked to conduct the ceremony and also be Wayne’s Best man. I don’t want to create a lavish ceremony, just a simple one, an affirmation of love and it’s power to transform, wherever it is found. If you wish to contribute to this celebration – flowers, cupcakes, cookies, music, clothes – you can contribute via Paypal, jon@bedlamfarm.com, or by check, Jon Katz, Wedding, P.O. Box 205, Cambridge, N.Y., 12816. Robin, Kissed By The Angels. Dybuks And Spirits. Forgive me, grandma, I just can’t spit near Robin. If anyone said anything good about their children, my grandmother Minnie, who was a Russian immigrant and a devout Orthodox Jew, would spit three times over her shoulder. God help anybody who was standing in the way. She did this, she said, to chase the evil spirits away, they would, she said, often try to harm blessed and gifted children, those who were, in her words, kissed by angels. The spitting frightened them, chased them away. One of my nieces won an academic award in the high school and when the news was announced at the weekly Friday dinner at my grandmother’s house, so many old women were spitting over their shoulders that the kids fled into the dining room. I have shed most of those superstitions, but the old Jews I know all believed in angels and cherubs and evil spirits. Like many oppressed people, the Jews needed to believe in supernatural spirits who watched over them, every of them felt lucky to be alive. If you were lucky and successful, that meant you were kissed by angels. If you were not, the cherubs would come and sting your cheeks, and the evil spirits would have their way. Jewish mysticism from the Old Country was one of my favorite things about Judaism then, although I didn’t stay with the faith. Their stories were full of dybuks and demons and angels and cherubs. The old Jews spoke of Dybuks in hushed tones, Nobel Laureate Isaac Bashevis Singer wrote of them in his wonderful books. The Dybuk comes from the Yiddish verb dabaq meaning to “adhere” or “cling.” They were convinced these spirits could save them from persecution, yet I often thought that the Old People didn’t seem to grasp that they almost never did. A Dybuk is a malicious possessing spirited believed to be the dislocated soul of a dead person. It will leave the host body once it has accomplished its goal, whatever that might be. They were not welcome in any Jewish household. You did not wish to mess with them. My grandmother swore there was one living in Old Man Silverman’s body when he died. She said she could hear him cackling at the wake. I don’t see my granddaughter Robin much, Emma is good enough to send me a steady stream of pictures. My photo-taking used to annoy Emma, she was afraid that I would point my camera at the wrong person in Brooklyn and embarrass her or get slugged. I think she was often afraid I would start trouble and embarrass her. Now, she has a kid who is just like me who says, and loves to start trouble. Isn’t life grand? I got testy and pointed out that I was a reporter for a long time, and bothering strangers was my stock in trade. I see now that Emma has become a wonderful and self-taught photographer with that special ability to compose a scene and capture the spirit of people she loves, especially Robin. Looking at this picture, I realized that Robin has been kissed by the angels. Unlike my grandmother, I don’t believe that abandoning spitting will necessarily draw the evil eye, quite the contrary I happen to know that the angels protect the humans that they kiss, I have an angel and we chat from time to time. Robin has a radiance about her that is special. She has a beautiful face, and powerful eyes that seem to be able to cut through steel. She gives the appearance of missing nothing, and has the sense of entitlement that children who are loved and well cared for often have. She sings songs, reads books, plays the guitar. When she looks at me, I have the feeling she sees right inside of me, her brain almost whirring as she takes in all in. I believe she has my measure. 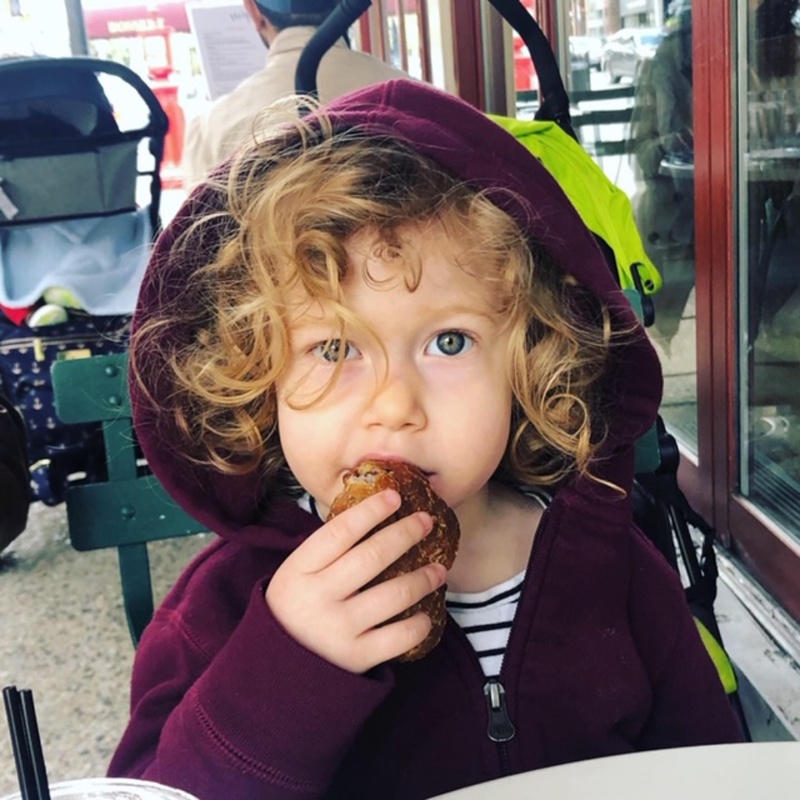 In the fall, she is going to the-pre school program at one of the best schools in New York City, the Brooklyn Friends School. As a member of a Quaker Meeting, I am pleased to see her going to a Quaker School, although this prestigious school will cost as much as college does for many people. Brooklyn is not like other places in America, the children of the new Brooklyn are part of a distinct culture. Robin is on a track, I think, she has been given almost every gift a child can receive. She is bright, funny, confident and creative. She is much loved by wonderful parents. Life can always intervene, but I think she is one of those people who can do whatever she wants in life. Like my newly-planted Sycamore Tree, I will not get to see where she lands. I don’t mean this morbidly, we will all end. But it is only in recent years that I have become aware of the fact that most everyone around me is likely to outlive me. That can inspire some thought. In my acting class, I was the oldest person, a common position for me in many groups. It is a relief for me to see that Robin was kissed by the angels. I’m sorry my grandmother didn’t get to see this exotic descendant of peasant stock from Kiev. But Robin has her her spirit, my grandmother looked right through me in the same way. If she knew Robin, there would be spitting all over the place, I don’t think Robin would like it. It is awe-inspiring for me to think of the blood of Minnie shaping this blessed child. Robin’s family has different superstitions. My grandmother was the one who told me the angels cared for the children they kissed, even if she had to spit on the spirits to keep them away. Sorry, grandma, I just can’t do it..
We had planned to go to a movie and out to dinner Sunday night but the farm had other ideas. 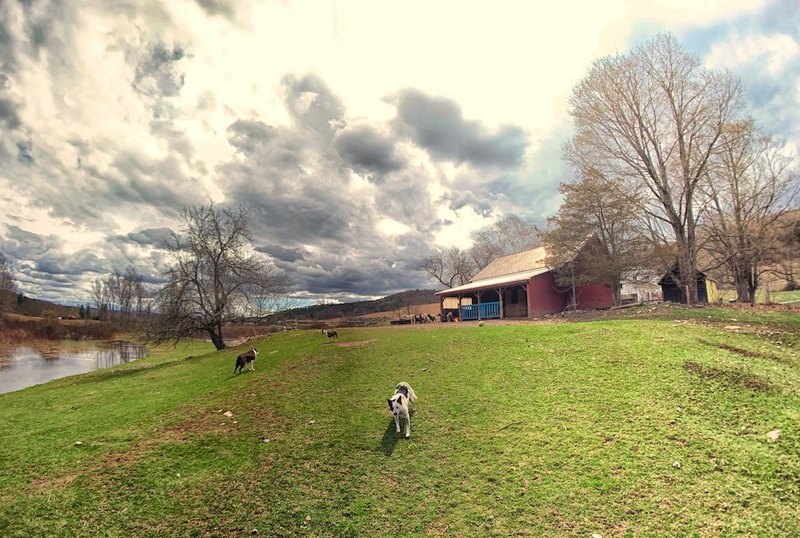 Spring Madness is here, the sudden appearance of green grass makes sheep and donkeys a little crazy. They tore the chicken wire off of one of the gates and we discovered breaks in the fence in the far pasture. Anybody with a farm and livestock takes fences seriously, especially when you live on a busy highway. Last week one of the sheep plowed through the wire fence out back to eat grass from our neighbors wide field. She came in by herself, but we took it as a warning signal. Last summer, the utility company came to cut down all of the brush near the fences, they did more cutting than they said they would do, and they exposed parts of the fence that were vulnerable. It took about four hours to get the new fencing up in the right places. Since the California wildfires, the utility company here has been on a rampage cutting down tree limbs and brush, often blamed for the wild fires there. They didn’t care much about our fence. We found some spaces in the wire fence big enough for a hungry sheep to squeeze through and some footprints and wool traces that suggested that they had. We also found wool on the wire where the sheep had gotten out and back in. This had probably been going on for a week or two, we might not have known about it if the neighbor hadn’t come by to warn us. After eating dry hay for months, sheep go wild for fresh green grass, and the sugar in it makes them a little nuts. I called Greg Burch, our firewood supplier and ordered seven cords of wood. April and May mean it’s time to prepare for winter. Next week I’ll order first cut hay. The price of everything goes up every year, it never stays static and it never goes down. So we started putting up wire mesh. 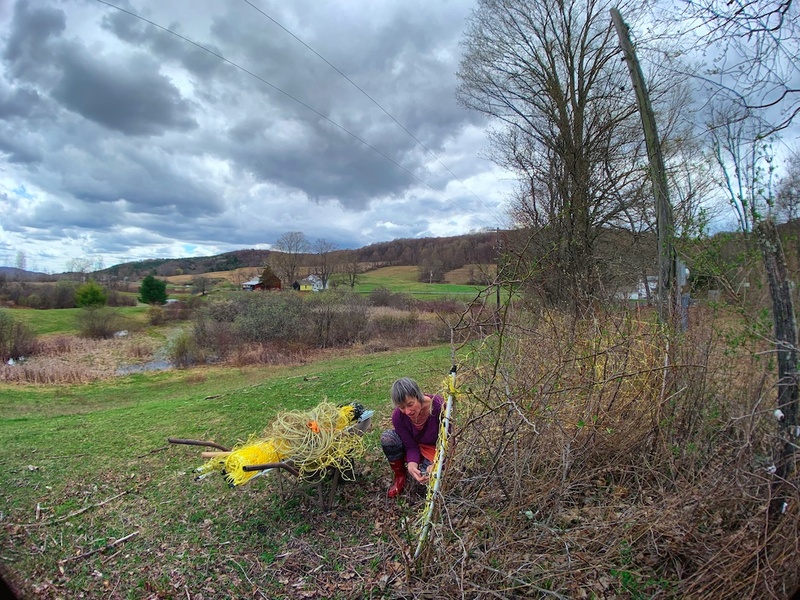 Maria did most of the work tying the mesh to the fence, it’s hard for me to kneel – the sheep won’t challenge fencing like that. Our electricity is out because of all the flooding, and sheep with their heavy wool don’t feel the shock anyway. We also got out the staple gun and some chicken wire and secured the mesh on the Pole Barn gates. We also got Giselle and Zelda into the barn for some grain, they are fattening up, Giselle’s ribs are disappearing once more. So no movie, and my legs are protesting from all the walking and hauling brush around. Maria is happy and cheerful, she loves farm chores outdoors in beautiful weather. I am lucky, lucky. I’m also happy to report that our Easter Podcast on Brenee Brown, us, vulnerability and courage got 100 plays in just the first few minutes. We weren’t expecting that on Easter Sunday. We’re planning on once a week, except for breaking news. I’m cooking tonight, where staying home and I want to write more about vulnerability tonight. Tortellini I think with Artichoke Pesto. We dug the hole, put in peat moss, then soil, then mulch, then gave the tree a good long soaking. I’m the waterer, I’ll be watering every day. Maria is very happy when she is planting something, she says the tree is very connected to us because I love taking p photos of that kind of tree, and she came to love it through my pictures. 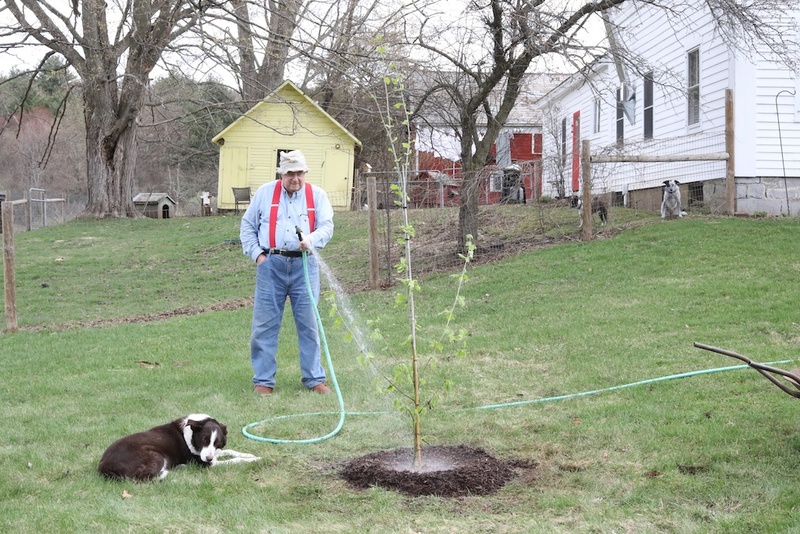 We both are happy thinking of the people down the road who will love their ring of trees.We have ensured there will always be big beautiful shade trees around the farmhouse, and Sycamores love to be near the water and we have plenty of that.